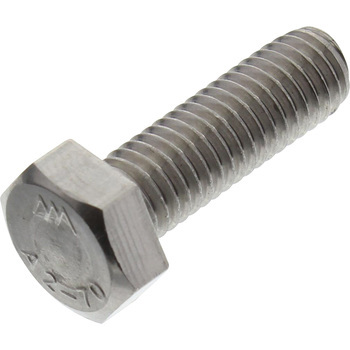 Stainless steel bolt name Although it is expensive, it can be replaced with plated bolt because it is easy and satisfying. This review is about item#45522836. This review is about item#45522827. It is a repeat. There is no problem in terms of price. This review is about item#45522811. I am satisfied because I can not get it at nearby stores. It can be used as usual bolt. Since the M8 prepares several kinds of lengths, the small packs are saved. I purchase it every time, but it is hard to use that the hexagonal part is 13 mm.It is not problematic in terms of goods but I think that it is easy to use if the hexagonal part is 12 mm or 14 mm. The finish is also beautiful and the bolt itself is not inferior to the general one. However, it was regrettable that the plastic bag was split in the state that it arrived and it was scattered in the box. Although there is no problem in terms of price with regard to use, if you purchase in small units, there is no indication in only simple numbers in simple packaging, you can not figure out how many mm of bolt is of course diameter, of course. Used as a substitute for dip pickled bolt. If you look closely, there are fine scratches on the thread, but practically no problem at all. Anyway the price is attractive.